Happy Friday Y'all!! I'm doing my "happy dance" in my polka dot pants because.....drum roll please....I'm back with my series where I and another blogger, oh wait, the person may or may not be a blogger...but we are opposite in some way and we show how we style an article of the same clothing...yes, I really need to get a name for this series...maybe you guys can help me...I could do a giveaway to the winner! Today, the lovely Shamara of Beau Life is with me and it is all about the polka dots...I'm obsessed with polka dots...I can't help but smile when I see them! I'm happy to say that this is our fourth feature together in this series...you can check us out here, here, and here! So while I have your attention, I want to chat about "Women Supporting Women"....I think it's such a beautiful thing when we help and support each other....just simply being there with words of encouragement....being there if you need to get a good cry out....being there to vent....being there to tell us what we don't want to hear but we know it's necessary....being there to have each other's back...being genuinely happy for you and for your accomplishments....now here's the tough part...when you are truly happy for someone when things are a little rough for you and you can still celebrate their success....no envy.....no jealousy....always remember that what God has for you, it's totally for you...so be there for each other and I believe that certain people are put in our lives for a reason.......so, let's support each other and make a positive difference! 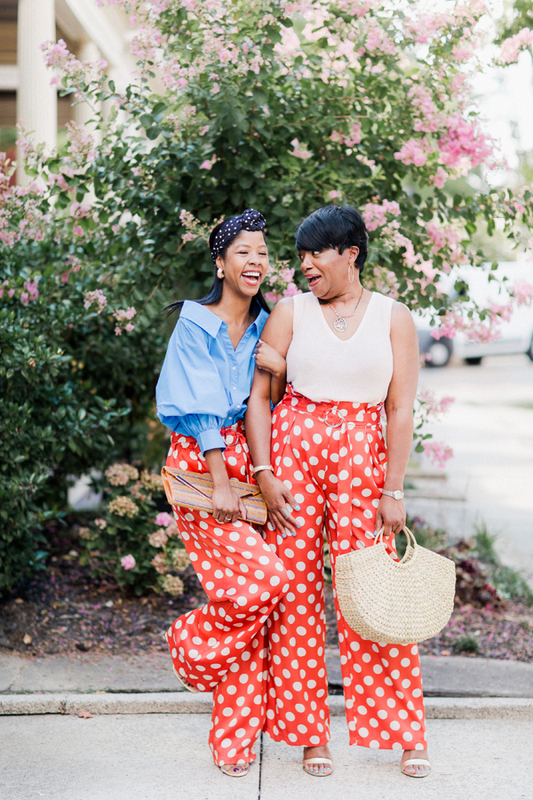 Now for the deets on what we're wearing.....I always have a great time with Shamara and we are all about the polka dots today! The pants are from Zara and Shamara paired her polka dots with a Zara shirt, headband and earrings and her sandals are from Vince Camuto and her sunnies are from Free People. The Loft Sweater Tank I'm wearing is actually a soft pink in color (it looks neutral in the sun) and I'm carrying my straw bag from Zara and shoes from Sam Edelman which are now on sale and my sunnies are from Free People. Mrs. Michelle Obama & Me!